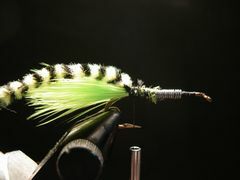 The Brim Special, created by Tom Lentz, combines the action of marabou and rubber legs with two great warmwater colors - chartreuse and black - to make it a dynamic panfish fly. Underbody Lead Wire - Optional .015 Dia. 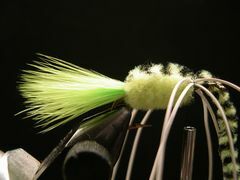 Florida angler Tom Lentz derived the Brim Special from a pattern called the Hum Bug, one of a series of panfish flies from The Gaines Company, a manufacturer of fly-rod popping bugs and other lures. 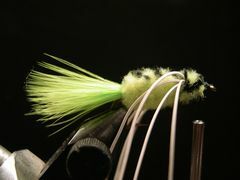 The color combination of chartreuse and black is a deadly warmwater dual just as yellow and black is. For some reason the addition of rubber legs that are white seem to enhance the fish-taking ability of The Brim Special. 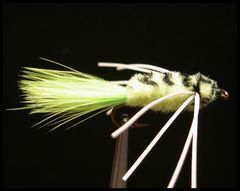 White legs seem to work well on a number of other panfish flies as well. You may have to check a couple of sources for the right color of variegated chenille. I have seen it called chartreuse/black, worm green/black, and other green/black combinations. 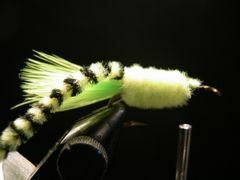 One source that definately has Chartreuse and Black Variegated Chenille is Flyfisher's Paradise in State College, PA. Check "Web Links" on the Navigation Bar for their address. 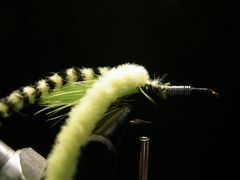 They also have Brown and Black Variegated Chenille used for the shellback on the Brim Fly. 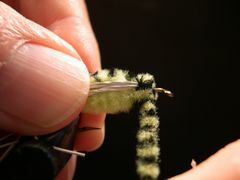 There are a few techniques that make tying with chenille more interesting. Click on "Chenille" before you tie the Brim Special. I fish both weighted and un-weighted verisons of the brim special depending on the time of the year and the type of structure I'm fishing. In the spring when the fish are shallow I fish the un-weighted version. As the season progresses and the fish seek deeper and cooler water I switch to the weighted version. 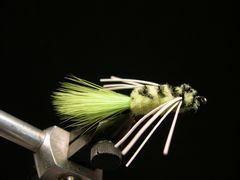 I often fish the edges with the Brim Special and it's companions, the Brim Fly and the Panfish Polecat. By edges I mean casting parellel to the edge of weedbeds, rock jettys, fallen trees, or the bank. In the heat of summer I have great luck fishing a weighted Brim Special parellel to the weed beds that seem to extend 20 to 40 feet from shore in many of the ponds in my neighborhood. Often times there are cuts or pockets in those weed beds that can be great fish producers. I try to fish all of the edges of the cut or pocket. Of course you need to be in a kick boat or float tube to do this successfully. 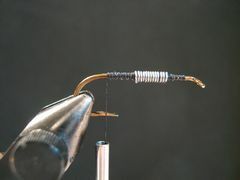 Be sure to attach the brim special to your leader tippet with a loop knot to give the fly as much action as possible. If you aren't familiar with that kind of a knot click on the "Knots" page. Attach the thread at the front of the hook and lay down a base of thread from the hook's eye to the hook's bend. 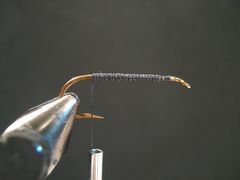 Wrap 10 to 15 wraps of lead as shown slightly forward of the center of the hook's shank. 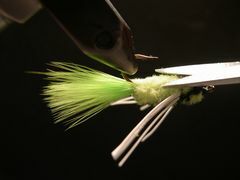 Attach the marabou tail to the rear of the hook, binding it down from the hook's bend to the thread wraps. The tail should be approximately as long as the hook. 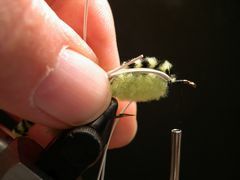 Tie in the piece of variegated chenille for the shellback on top of the hook's shank at the base of the tail. Tie in the piece of chartreuse chenille for the body in the same way that you did the piece of chenille for the shellback. 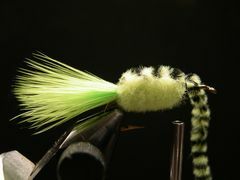 Wrap the chartreuse chenille for the body forward to about the two-thirds point on the hook's shank, bind it down, and remove any excess material. Pull the variegated chenille forward to form the shellback and bind it down. 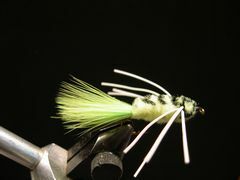 Prepare two sets of white rubber legs with two legs in each set. The legs should be about two and one-half inches long. Attach one set to the far side and the other set to the near side of the hook's shank. 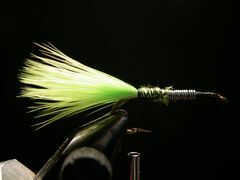 Move the tying thread to about an eye's width behind the hook's eye. Pull the legs back out of the way with your left hand so you can form the head by tightly wrapping the variegated chenille with your right hand. Take the first wrap of chenille tightly against the rubber legs so that the chenille will force them back. You probably will want to take two turns to hold the legs in place - one on top of the other - followed by another turn or two to finish off the head. Bind down the chenille, remove any excess, form a neat thread head, and remove the thread. Trim the legs to a length that suits you. I like them about three-quarters of an inch long. If necessary, take a few well placed snips with your scissors to shape the bugs body so that it tapers from the front to the rear of the hook. Your Brim Special is finished!